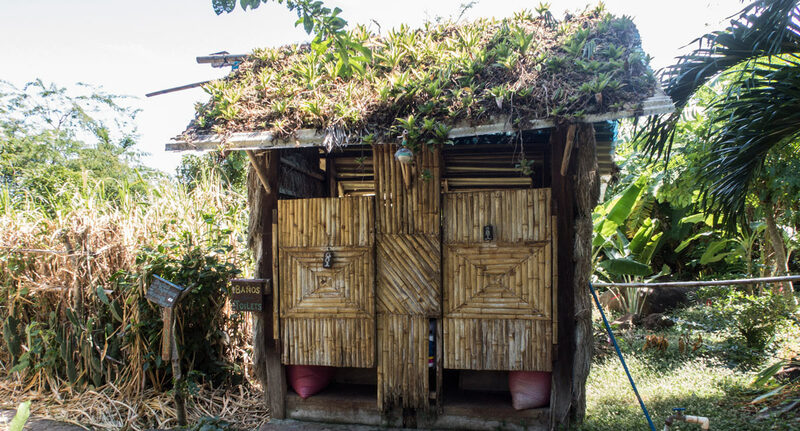 From the beginning of the project, one of our goals was to build “dry composting toilets” rather than the modern kind which use a lot of precious water. In rural zones such as ours, ecological dry toilets are the best answer for reasons of hygiene, conservation of the environment, production of organic fertilizer and, in this way, our precious water may be used for other purposes. The way these toilets work is extremely simple. Once a person has used the toilet bowl they must throw in the toilet paper and then cover all remains with 2 or 3 scoops of rice kernels or sawdust which are provided in each toilet in large sacks. When the tanks of the toilets are full, they are emptied and the organic remains are then mixed with dry leaves, hay, earth, green leaves, ash and water and are then left to steep for about 2-3 months. Every fifteen days or so water is added and the mixture is stirred. At the end of the process we have an extremely efficient organic compost which we use for all of our plants including the vegetable gardens.